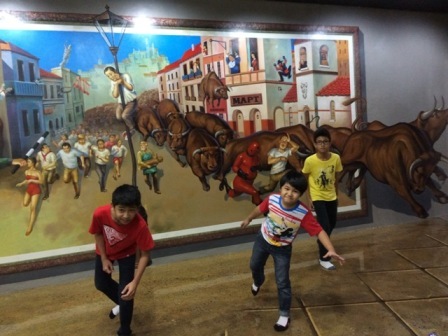 In each masterpieces, the boys can be part of the artwork and may play with the art. They may invent their own poses or copy others’. And because they can really interact with the art, they have this overwhelming feeling of excitement. One needs to be imaginative though of his poses with the artwork. Before visiting the place, this mother checked out photos of other visitors so she may have an idea on how to direct her boys. Good thing there are photo samples, too, on the walls for inspiration should one becomes so clueless of his pose. Also, there are camera angle guides on the floor where photographers can stand up and shoot. Museum staff are also everywhere and they can readily give assistance should one asks for it. 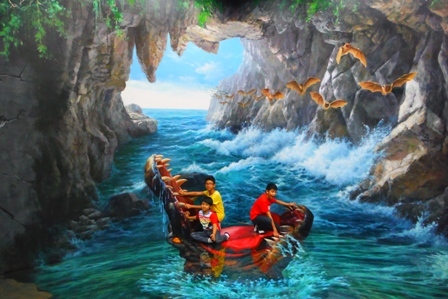 The Art in Island encourages its visitors to be part of the artwork thus, contrary to other museums where touching and taking pictures are not allowed, everyone at Art in Island may use his camera– mobile phone camera or DSLR — but strictly, no flashes, please. One will be asked to deposit his footwear before going in. I required the boys to wear socks and I brought my own socks, too, because I read in some blogs that the floor is quite cold. 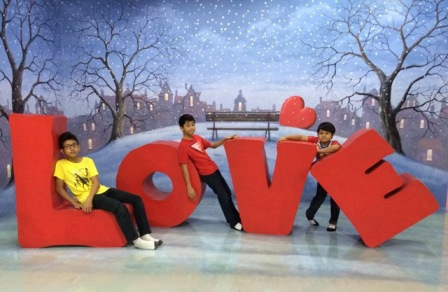 At P500.00 for adults and P400.00 for students, one can tour the place for as long as they want. With three boys in tow, we are able to tour the museum for about three hours. Reminder though, students should bring their IDs for proper identification that they are indeed students. Birthday celebrants are free of charge if they visit the place one day before or after their birthday. Here are a few of my boys’ playful interaction with the art. Too naughty to play with other’s underwear. Lodge into the jaw of a monster and yet not feeling any fear. 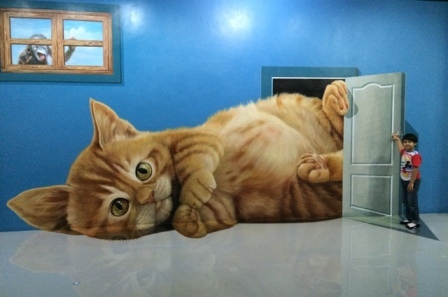 Have the courage to face a super giant cat without being intimidated. 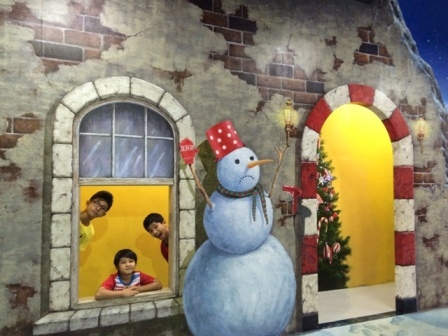 Experience snowy Christmas for a change. 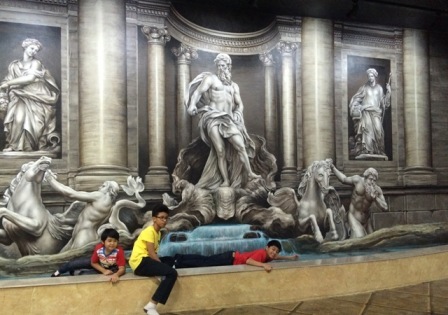 Being too playful with the water with statues as backdrop. Assuming to be part of the race. Be a puppet of a wicked witch. 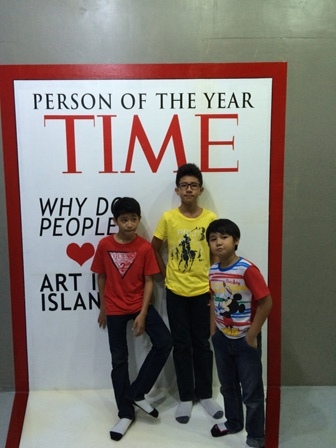 Art in Island highly encourages its visitors to be part of the artwork and experience how to be in a magazine cover. Thank God for a hardworking husband who rather wants his wife to stay at home and look after their growing children. * This Art In Island tour was last May 2015, a birthday treat to our firstborn. We visited the place again last January with our baby Yael in tow. How amazing for you children that they can spend so much time with their mom. That is so good for there knowledge to go to a museum. This looks like a playground too. 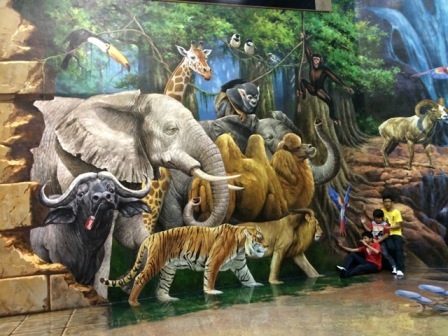 The pictures are fantastic, where you see the children interact with the paintings! Looks very promising and nice, I would like to take my children here in the future. They enjoyed their stay and surely your children will enjoy such place, too, in the near future. Ay nakakatuwa naman, parang dumadami na ang ganyan sa atin no? First time I saw this was when friends showed me photos from Singapore. Ngayon, even here meron na rin and a good way for parents and children to bond too. The Jaw Monster pic is something that I can totally see/ have imagined while reading a few of Rick Riordan’s books! Awesome pictures, and this is an awesome way to get the kiddos interested in art 🙂 Sad that this is in QC, I can’t travel there without someone who knows the way because I know I will get lost. Sa Baguio nga nawala rin ako kahit na I’ve been going there since I was 3 years old hahaha! Hahaha. And so you’re a fan of Rick Riordan? My son is a great fan, too. He finished collecting his Percy Jackson series as well as the Kane collection and the other one I forgot the title. Haha, should I ask my son if he wants to sell his books? Ihihi. Booksale perhaps? Teka, i will pm or message you kapag naremember ko ung name ng second hand books na binibilhan ko before. Wow , these photos are amazing ! Who has got such photos of their kids ?! I looove that idea of that museum . The pics look so real , just amazing ! It’s not my first visit to your site , I always enjoy your stories about the lovely things you do together as a family . So wonderful to see , you’re a great mother !!!! Thank you. I took the pictures. 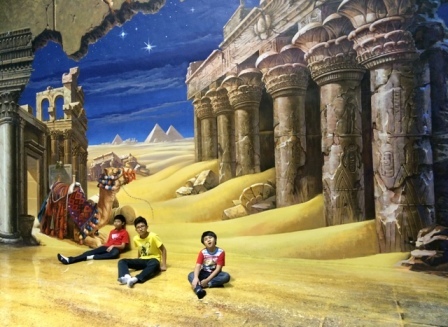 And yes , the kids enjoyed the museum as much as they enjoyed the food at the cafeteria too. Touring the museum made them real hungry. And thank you for such kind words. 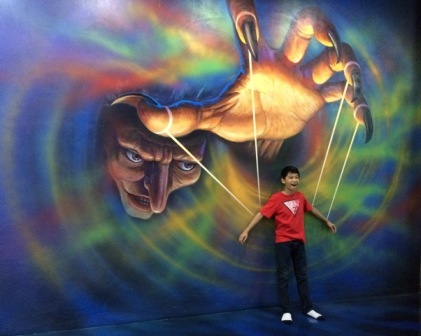 Ever since I’ve learned of the existence of a trick art museum, I’ve always wanted to go to South Korea for it. Now I don’t have to go to Korea just to experience it. We’ve always been planning to go here. We just don’t find the time. Hopefully, we’ll be able to go soon after summer. Thanks for sharing the photos of your sons. At least, we have some ideas now for our shots. Visiting art museums is real fun. But your travel in Batanes is what I am aiming for this year. I never thought there is such a museum in Cubao, haha! Though I have grown-up kids, we’ll visit this when able. I love the pics, so creative. Galing no? Yes, visit the museum. It’s worth the time. They have a cafeteria as well if you want to take a break from taking pictures and posing on artworks. This place looks really interesting. I’ve seen other museums doing this but I forgot where they were located. One was Iron Man, others were paintings too. Thanks for sharing us some photos and how much it costs. When my little daughter grows up a little more, we hope to drop by there. Surely your daughter would enjoy the place and the paintings. They also serve nice food. I remember Seriland at Manila Ocean Park they offer the same attraction, but unfortunately they were closed now. Hope this one won’t fall on. Hopefully not. On our second visit, the museum was still jam-packed.